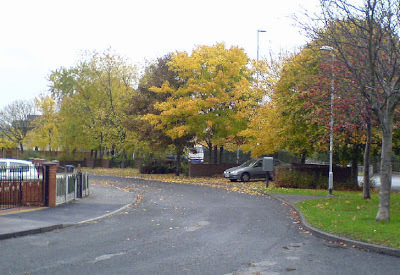 These photos were taken on 30 December 2008. Just a quick visit really to gather a few vegetables. It's amazing that there is still so much being provided for the table as looking at the photos it seems a bit barren. Again it was bitingly cold although dry. Not really the type of weather to encourage too much hanging around. The most December activity from our point of view other than collecting vegetables is the opening of the parcels of seeds as they are delivered to the door. The shortest day has now passed and in theory daylight hours are on the increase - not that this is really evident at the moment. These December photos are likely to be the last of this type taken. After two years of seeing similar photos I am sure most visitors are now well aware of what our site looks like and are becoming bored with this format. There will be some sort of new photos but as yet I am not sure what these will be - any suggestions? December's diary is short but not very sweet click here. Any comments on the effective use of bio-assay testing would be interesting. Fancy taking a bath in cold water, outside in December and then sitting around to dry off? It doesn't seem to bother our feathered friends. How did it get to be December so quickly - click here for the December diary. Here in Wakefield we seem to have, so far, got off lightly as far as snow is concerned. A light covering overnight was soon melting and turning to drizzle. However, the birds immediately spotted the food that we popped out for them and were soon tucking in. The snow is a problem when birds are foraging on the ground. 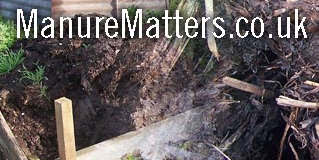 It can also cover over the food that is placed on uncovered bird tables. Those bird tables with a roof provide some protection. Hanging feeders are more accessible but don't suit all species although many birds that are not supposed to feed from feeding tubes seem to be adapting especially if the feeders have trays attached to the base. It is important to provide a variety of food types and offer them to the birds in different ways. Wrens for instance prefer to feed under cover so don't readily come to food placed out in the open. During winter try to provide food with a high animal fat content click here to read more about making fat cakes. 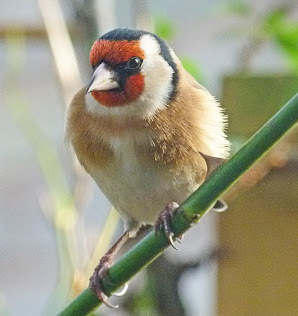 For information on feeding birds try the RSPB web site click here. Snow isn't the only problem during very cold weather, frozen ground makes life difficult as does frozen water. Even in bitterly cold weather birds need water to drink and in which to bathe. It makes me shiver watching them splashing in icy cold water but is necessary to keep their feathers in good condition. 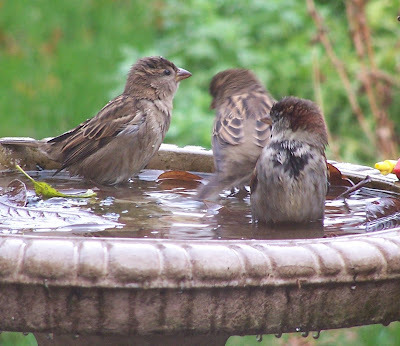 For more information on providing birds with water click here. 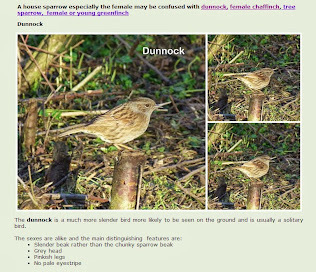 The November diary is now completed click here to view. November's photo album is now uploaded on the website click here. When the photos were taken it was bitterly cold but at least it was dry and the wind wasn't blowing. Activity on site has slowed down with plotters maybe spending at most a couple of hours before heading home for a warm. The very wet conditions means that the soil wouldn't thank you for trudging all over it. Those who are braving the elements are generally busy with construction projects, taking care of livestock or path renovation. There are still plenty of vegetables to be cropped so there is the necessary visit to gather. The leylandii hedge along our southern boundary is now not only casting heavy shade onto some of the plots but is also causing the frost to linger on affected plots. This is a big problem early in the season as not only do early crops suffer lack of light but the ground is often too hard to dig. The heavy clay soil also takes far longer to dry out. As it is growing on private land apparently the council can't do anything to help the situation. Has anyone tried companion planting? What have you used and has it worked? Have you successfully combatted whitefly? Post a comment to explain your methods, I am sure if we can find a successful strategy to curb the whitefly, we would all be really grateful!! Seeing as the weather is just too awful for gardening - even if the soil wasn't sodden, it has been really cold and windy this week - I have been amusing myself by making a couple of calendars. Just as a small thank you to those of you who have supported our fund raising by using our shopping links, or have supported our website by visiting often or emailing information to include on the pages devoted to the manure problem, I have uploaded the finished calendars onto our web site. Feel free to download them and print them if you wish. As they are very much linked to our allotment site they won't have wide appeal but they are here if you want to access them. The PDF preview doesn't show all the lines in the dates' table but they are all there and will print out OK. All you will need is a method for fastening all the pages together. Even if you haven't supported us you are welcome to use the calendars and maybe you will visit our shopping pages to buy a couple of gifts. Harrod Hortcultural in particular offer special deals for people ordering through our site. You can also shop with Amazon and earn us a little commission too. At this time of year the weather and long nights curtail gardening activities, so it's more a case of grabbing an hour when you can. 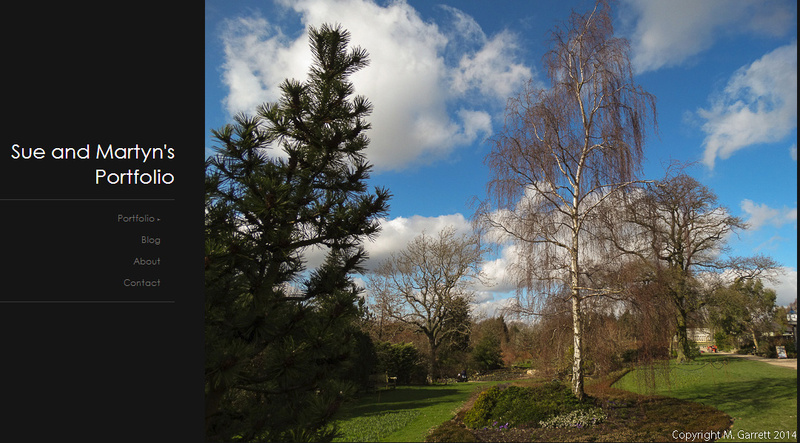 There's lots to see in the garden if you can drag yourself out of the warmth and try to go and have a look. Harrod Horticultural have just emailed to say that they are offering 25% discount on all their timber raised beds 'til the end of 2008. Click here if this interests you. Well it's now November and winter is drawing in - anyone notice the difference other than that the trees are losing their leaves and plants are dying back? The November diary has now been started on the website click here to read more. Alastair on plot 56 took the above photos on site on Saturday night. Just goes to show that the site can be colourful even in November. If there are any other expert camera persons, (being politically correct), on our site who have a shot taken on site that they think is worthy of adding to Alastair's collection - just send them along. Do you work in a school? If you work in a school that has its own vegetable patch or is thinking of having one then this website may be useful to you! Have we really only two followers? Oh dear! Come on make my day and add yourself as a follower - it's easy - just click on Follow this blog on the sidebar! Are we in danger of losing the gardening buzz? There has been much in the news recently about fears that the bee population is in serious decline. 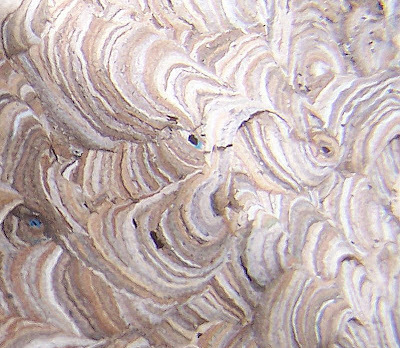 Bee keepers comment that hives often resemble the Marie Celeste. Lord Rooker a minister from DEFRA has been reported as saying that the honey bee may become extinct within the next ten years. One problem for the bees has been the miserable wet weather over the last two summers which prevents them from foraging successfully. Bees are also suffering from a loss of their food supply. They feed from flowers which are rich in nectar. Although we still have flowers in our gardens – many of these will not provide the nectar that a bee requires. 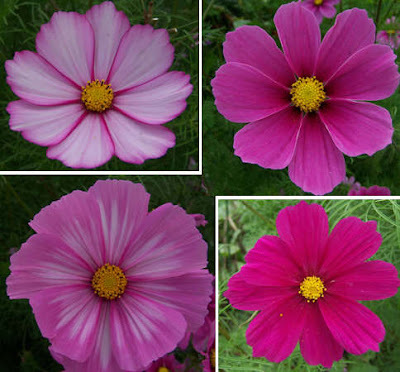 The double flowered varieties loved by some gardeners are not useful to the bees as they have difficulty accessing any nectar that may be present. 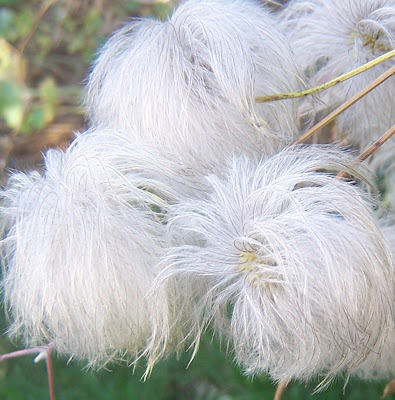 Some choice ornamental plants have little pollen. At Chelsea this year green was the ‘in’ colour – gardeners are increasingly growing plants for foliage rather than flowers. No flowers means no food for the bees! The loss of wild flowers in the countryside and use of pesticides and herbicides have had serious impact on the bee population. Bee disease and parasites are also suspected for the high losses. Being under stress bees more readily succumb to disease and the effects of parasite infestation. If all that wasn’t enough, the honey bee population is under threat from a foreign invader – the Asian hornet which preys on honey bee hives. 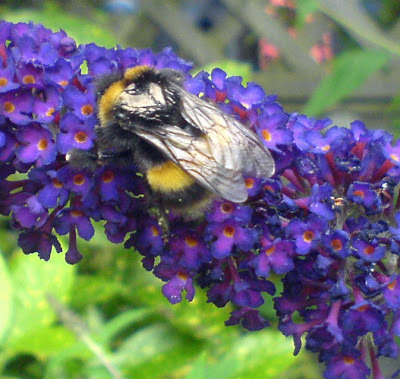 Click here to read more about the bees that share our gardens and plots. October has gone and good riddance! 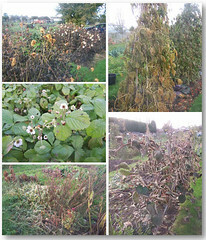 This was the week when winter descended on the plot as the photos below prove. The couple of days of cold frosty weather have put paid to most of the flowers and greenery. It marks the end of what has been an awful month when there has been far fewer opportunities for working on the plot than we would have liked. Not sure what November will bring but I just hope it will be kinder to us. Design a runner bean frame. 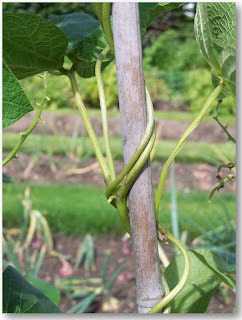 As all vegetable gardens know, runner beans are climbing plants that need a support frame that they can wind around. Many gardeners stick with a framework of bamboo canes held together wigwam or maybe a tunnel style. As a project for the cold winter days when we can't spend as much time as we would like to out on the plot, why not let your young gardeners 'have a go' at designing a more interesting structure? If you haven't a young gardener in your family you could always try yourself! If you manage to create an interesting framework why not take a photo and send it along to us to feature on our blog? The above photos were taken on 27 October 2008. Snow and really cold weather was forecast for the 28th (it was really frosty this morning and it certainly is cold but as yet no snow), so I thought that I'd beat it by taking the photos the day before. It was a sunny day although at this time of year the sun doesn't give much warmth so it was a three layer day. The sun was really low and made photography rather difficult so some of the photos had to be discarded due to sunspots. At times I couldn't really see what I was aiming at! The leylandii hedge along our southern boundary is already beginning to be a problem casting heavy shade onto some of the plots - the photos don't adequately reflect this as I tweaked them a little to improve the quality. Unfortunately it was unavoidable to get my shadow in many. We were the only pair down on site when I took the photos - although one or two others came and went. It's a sign of the time of year. 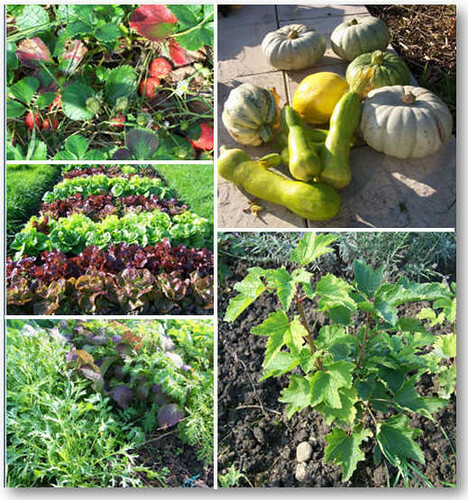 Some plots are almost clear, having only a few winter vegetables left in the ground or some planting to overwinter for harvest in early spring. Other plotters visit to feed their livestock which need attention whatever the weather. Being gardeners we all look forward to next season and hope for better things to come! Time to dig out the catalogues - don't forget to use our links and shopping pages to gain us a bit of commission for our fence fund! As a result many of us will be avoiding manure this year. If you are considering obtaining a supply you should be aware that although the herbicide that is suspected of causing the widespread problems last year has been temporarily withdrawn from sale, contaminated manure will still be in the system and could be for a while. Fields will already have been treated this year before the withdrawal and also the persistence of the chemical means that its affects can linger for a couple of years after use, especially in stacked manure piles. If you want to obtain manure you should seek assurances from the suppliers that no herbicide containing aminopyralid has been used by them or by any of their suppliers of silage or bedding. If a contract sprayer has been used your supplier needs to know which herbicide was used to control any broad leaved weeds growing in fields that animals browsed or from which grass was harvested to make silage or hay for bedding. The most common herbicide that contains aminopyralid is 'Forefront" although there are other products too. In order to give these assurances your supplier needs to know what chemicals have been used in the supply chain not just make assumptions. If your supplier tells you that the manure that is on offer has been stacked for a long enough period to ensure all chemicals have dissipated it is likely that they are unaware of the persistence of aminopyralid. If after speaking to your supplier you are in any doubt them don't accept manure. It's not too late to contact us if you think you have been affected by this problem. I am especially interested in any cases in the Yorkshire/Humberside region. Another update to the October diary is available now although I have to admit to not having as much to report. Partly due to the time of year but also the onset of sniffles keeping us away from the plot. Click here to read. We did manage to get a bit of video of the birds enjoying themselves on our bird feeder. Many of the videos uploaded onto the website have been converted from YouTube to Google videos so hopefully the quality is a bit better. A couple of years ago we bought a medlar tree which we planted in our garden - more for it's ornamental value than anything else. This year we have harvested a bumper crop - well OK - we have just picked five medlars but considering the tree only had five flowers and it is only a baby that wasn't bad. Now apparently we have to 'blet' them - which seems to mean let them start to rot - before they are edible. 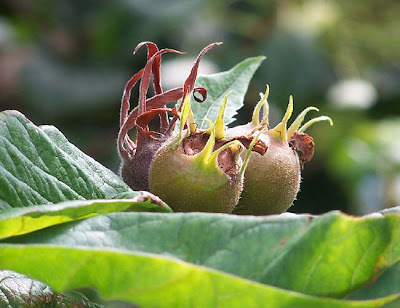 Has anyone any experience of growing or even eating medlars. Must admit having mixed feelings especially as apparently one of the nicknames that the French have for them is 'cul de chien' which politely translated means 'dog's bottom'. Click here to read more. We have decided to move from housing the video content on our website using YouTube to Google Video. All new videos will be in this format and we are going to transfer some existing videos too. We have never been really happy with the quality of YouTube videos and are having particular difficulties in the way it handles widescreen video. We think that the quality of the videos when uploaded into Google Video although not perfect is much better. Rather than viewing on the web page, for a better quality still, each video can be viewed directly in Google. Click on the arrow on the Google emblem at the bottom right of the video browser. Don't opt for Ful Screen as the quality just isn't good enough when displayed in that format. NB: The above image is just a screenshot of the video browser so it doesn't play the video! Alastair took these photos on Monday evening around 8:30. Someone’s hard work gone to waste! Please report ANY damage to the police – no act of theft or vandalism is too small to report! Also report any loss or damage to Sue or Jan so that we can keep records. If you saw anything suspicious on Monday evening prior to this time please report it to a committee member. As you are aware the gates should be locked at all times - failure to do this could mean that someone else suffers! We have email addresses for many plot-holders, however if you do not have an email address or don't check email regularly, you may prefer to let us have a contact telephone number so we can keep you updated of any problems on your plot. If you prefer not to have your experiences posted on our website then any information that you give will be treated as confidential but it will give us some idea of the extent of the problem in our area. So far we know about an allotment site in Chapel Allerton and a garden in Ossett but I am sure this can't be the full extent of the problem locally. Surely we haven't been so unlucky! The October diary has been updated click here to read. This weekend has been like a belated summer. The weather has been lovely but one difference is that the beds on the plot are becoming bare as the season draws to a close. We are also planting one or two things to over winter such as winter onions. There are still enough flowers to gather for vases for the house but no doubt shortly the first frosts will put paid to that. We are also still gathering berries. Last year we gathered the last of the alpine strawberries in November when we had our first keen frost. We'd like to sow more alpine strawberry seeds this year and would really like to try a different variety. The problem is that the only variety that we can find is Mignonette which is the one we already grow. Does anyone know where we can find anything different? You can't really mistake the fact that autumn is now well and truly with us as the trees are very much now in their autumn phase. Lovely colours for some and bare branches for others! We have had a few new people join our community this year. Today I managed to catch up with some of them to grab a photo for our plotters album although some of the children were a bit shy. Our updated album can be viewed by clicking here. If I have spelled your name wrongly or got the wrong plot number please let me know. If you are still not included in our album you needn't think you have escaped completely! There is always another day! The new plot holders are really making in-roads into sorting out their plots so well done. Looking through the album one thing that did strike me was how much some of the children have grown - I wonder if they can be persuaded to let me take a new photo? It already October and autumn is setting in - pity that we missed summer altogether. The diary for October has been started over on the web site. 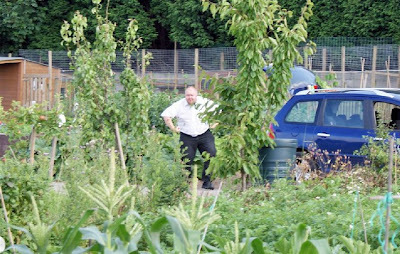 By the way the photo of an allotments site in the Daily Mail article wasn't Green Lane - they cheated!! September's diary and photoshoot are now complete click here to visit. I cheated a little with these photos as they were actually taken on 2 October, I was away on holiday for the last two weeks in September so didn't manage the usual photoshoot. (For those of you who DON'T find other peoples' holiday snaps boring I have included a few of ours - for those of you who do then sorry! Just ignore them). September was yet another disappointing month (I am really fed-up of saying that). On TV last night was an article explaining how our native deciduous trees are suffering - partly due to lack of rain!!!! Another problem appears to be that pests that would usually be killed off by the cold winters are now surviving and building up their population. As gardeners, we have experience of this too with whitefly populations building up. Other pests that would usually not be found in our country are moving north and colonising. The forecast is for another mild winter so the problem is set to worsen, and yet in the first week of October they are forecasting potential ground frosts on a night. Is it just me who finds understanding the weather and all the predictions and assessments about where our climate is heading to be confusing? All that aside it is very autumnal now - as the sunspots on the photos prove, when the sun actually does decide to show itself it is very low in the sky and has little strength as far as warmth goes. Plots are being cleared and it very much feels like this season is drawing to a close. Being gardeners we all look forward to next season and hope for better things to come! Time to dig out the catalogues - don't forget to use our links to gain us a bit of commission for our fence fund! 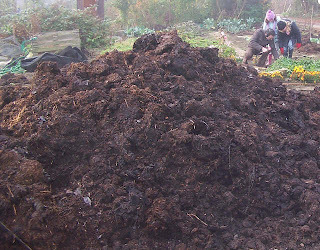 On GQT they stated that each year 90 million tons (or was it tonnes) of manure is produced. If gardeners stop using it, then where is it all going to go? Any thoughts? The aminopyralid saga featured on this week's Gardeners' Question Time. 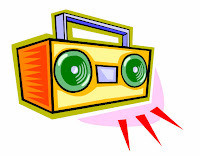 If you missed it you can listen via their web site click here. I would appreciate any comments with reference to the advice that it is OK to use up contaminated manure by spreading it as a mulch on ornamental borders or any other comments on the programme. You may have noticed a lull in the postings this month. For a couple of weeks we have been on holiday in the Var region of France. More on that later. I also had a letter awaiting me from one of the MPs that I wrote to, Mary Creagh. Enclosed was a response from Phil Woolas. In the letter Mr Woolas confirms that the 'The possibility that crops could be affected by contaminated manure was anticipated .......... As a result, the restriction that manure should not be applied to those sensitive crops was added to the label" He goes on to say. "Following label instructions is a legal requirement and failure to comply with the conditions of use is a prosecutable offence. I do not think it could reasonably have been foreseen that so many farmers would appear to have been unaware of the restriction, or to have disregarded it." He also states that, "Farmers and distributors do not, in any case, hold large stocks because of the cost, and these products are thus only in the system to the extent that they have already been used in 2008. This may still have a potential impact on manure sold into 2009." On testing he says, "Establishing whether manure or compost might be contaminated is indeed difficult. Sensitive chemical tests do exist for aminopyralid which are capable of detecting as little as 10 to 20 millionths of a gram of the substance in a kilogram of plant material, soil or manure. However, these tests are highly complex and expensive and some plant species, particularly legumes are sensitive to even lower levels. .... This means that chemical analysis is unlikely to be an affective way of monitoring residues." 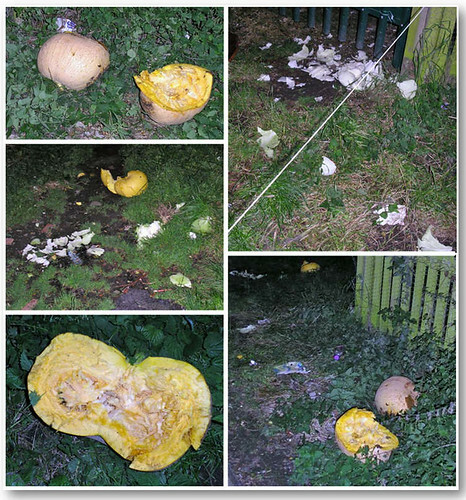 On re-instating the product he says, "The investigation that is currently being undertaken by PSD will be looking at how the difficulties that have arisen for gardeners and allotment holders may be dealt with and prevented in the future before re-instating the product authorisation. Should DOW AgroSciences apply for use of aminopyralid on cereals, they will have to address all the appropriate data requirements, as well as any relating specifically to this issue." On thing that struck me about his response was - if no-one is responsible for investigating misuse of the chemical then the fact that misuse is a prosecutable offence isn't really much help. No-one seems interested in finding out where misuse has occurred. Also some farmers, or indeed stable owners, use contractors to spray their fields so to just blame farmers seems a bit simplistic. Also if it is accepted that manure bought in 2009, (I would say probably even into subsequent years), could be contaminated what is being done by government departments to publicise this among gardeners and allotment holders. We have found that trying to get publicity - especially TV coverage which would reach many more people - is a bit like getting blood from a stone. The September diary has been updated click here to read more. We had a request from Ana Ospina - an artist who specialises in socially engaged practice and is currently working for Beam in Wakefield as part of the creative programme for the new Trinity Walk development,. She is working on a participative project to involve the local community and her work will form part of a workshop event on the 27th of September and a launch event in November. It will also feed into some permanent features. She has chosen to base her work on a modern reinterpretation of the Wakefield Mystery Cycle. The first stage of the project was to identify important groups or 'guilds' in Wakefield and find out some of their trade secrets. She came across our website during her internet based research and requested a visit. As a result she visited the Green Lane site on Saturday afternoon and spoke to several plotters, took photographs and filmed. For anyone interested the first part of the project on 27 September from 10:00 - 15:00 will be held at the Elizabethan Gallery which is opposite the new market hall in Wakefield. Aminopyralid Update from the Pesticide Safety Directorate. The PSD have issued an update "Aminopyralid - Results of Analysis of Contaminated Manure, Soil, and Damaged Crops"
This can be accessed by clicking here. PSD will continue to investigate this matter and hold further discussions with the main data holder, Dow. This action will help to decide whether, and if so, under what conditions the suspension of aminopyralid products can be lifted. Did any of our visitors take part in the analysis? If you visit this blog regularly - why not become a follower by using the new utility on the sidebar. You can do this anonymously but it would be really good if you would tell us something about yourself. Also there is a new subscription utility. Although to be really honest we haven't been very active in September just yet due to the really wet weather I have started the September diary. Click here to read- I haven't managed any photographs yet. Each time we try to visit the plot we end up being either drenched to the skin or working in mud. Visits have been confined to gathering produce. I hope that the weather has been better where you are! If you are lucky enough to have a glut of apples or other fruits and you just don't know what to do with them - then you may want to try pressing! Harrod Horticultural - one of our affiliated partners - offer a whole range of products that are associated with this. 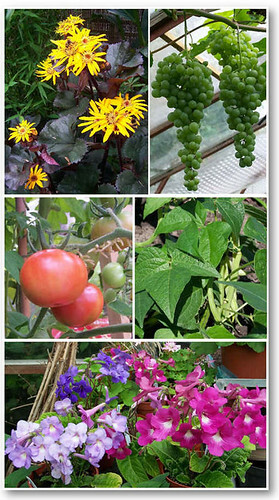 Visitors to our blog will know that we like to grow vegetables in all sorts of colours. This year we have grown several varieties of tomato including Black Crimea which is shown below alongside a redder cousin so you can get some idea of the colour difference. At first it was quite difficult for us to decide when the fruit was actually ripe. Black Crimea is a heirloom variety. 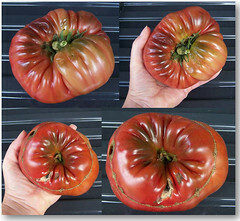 It is a beefsteak tomato with a fleshy interior that tastes good. Beefsteak tomatoes grow larger than other varieties and are great for slicing. Black Tomatoes are thought to have been taken home to Russia from Southern Ukraine by soldiers returning from the Crimean War. 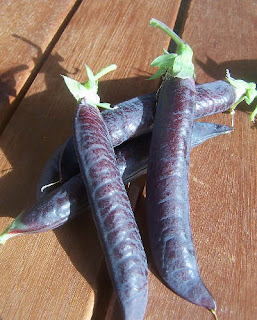 If you fancy having a go at growing them next year they can be bought from this web site (that is if the link is still viable - otherwise Google Kokopelli. We are going to try saving some seed and seeing if we can grow more tomatoes that way! Last day of August and, according to the Met office, summer is over. Their summer is June, July and August. Some parts of the country have had the wettest August since 1992 and the sunshine hours have been the lowest on record. It must be one of the only summers that we haven't had to water anything in the garden or on the plot. All this and we are advised to start growing drought tolerant plants! I hope that no-one has restyled their gardens this year with this advice in mind as I imagine they would have wasted their time and money. August's photo album show the dull conditions - I was lucky to manage a day that was dry! We have had a few new plot holders start work on plots this summer - they must wonder what they have let themselves in for! Anyway welcome belatedly to Denise & Martyn, Andy & Sarah, Mark & Catherine, Stephanie & Simon and Liam & Justine. Watch out as I will soon be coming round with my camera to add you to the rogues gallery. 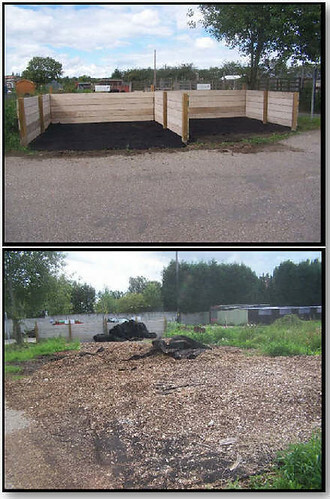 It is now ten months since we had our manure delivered and six months since the manure was spread on our plot. The potatoes that were affected badly by the contamination managed to grow through the problem and have a reasonable crop. Do we really want to eat them though? We have plenty more potatoes growing in beds that did not have manure applied so we are unlikely to need to eat the affected potatoes. 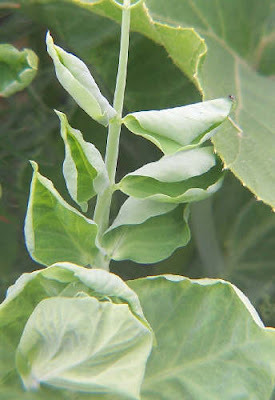 However safe they are to eat the fact remains that herbicide residue is likely to have been absorbed into the tubers and one of the real advantages of growing your own is that you can avoid consuming unnecessary chemicals. They were planted as a soil improver anyway and in many ways we didn't expect much from them. So we have been lucky. 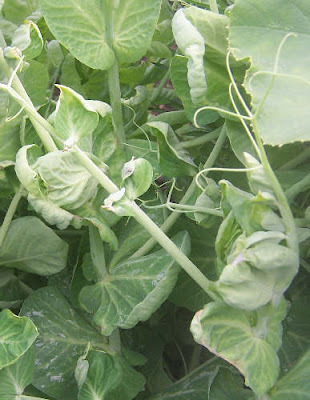 The affected runner beans never really grew properly and the one or two beans that actually developed are bent and twisted. We planted some sweet peas in an area that had been manured and another area that hadn't. Initially both sets of sweet peas were equally good having lots of flowers with long stems and a wide colour range. After a month or so of growth the difference between the two is now significant. The lot planted in unmanured soil are continuing to produce good flowers. Those in the manured ground have small, short stemed flowers that all seem to have reverted to one colour. Each stem has two flags at the most. About a couple of months ago we planted some tomato plants in both the manured and unmanured areas. all initially grew very well and produced fruit. About three weeks ago the ones in the manured area suddenly developed the ferny distortions and are obviously being damage by release of the herbicide. We also sowed some pea seeds in the manured area. Two rows were planted about a 45 centimetres apart. One row is growing well and has developed peas. The other row is patchy with some of the plants being stunted and displaying cupped leaves. Few peas have set. Clumps of dried manure seem to keep being washed to the surface of the manured plots so obviously the stuff has not fully decomposed and our problems are likely to continue. It is of concern that, maybe due to the poor summer, decomposition may be slow and therefore, could the contamination persist into next season? The Department for Communities and Local Government is responsible for government policy on allotments. The "Allotments: a plotholders' guide" - is published by DCLG for anyone who rents or is thinking of renting an allotment plot. 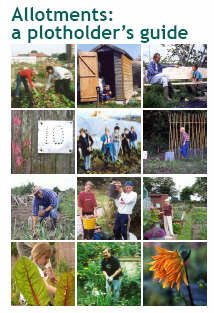 The guide covers all the subjects which will be of interest if you rent (or want to rent) an allotment. You may have come across it before - we have had a previous post with a link to the guide - however, the guide has been updated fairly recently and so it may be worth checking whether you have the latest edition. The dreaded blight has struck! We have been on alert for it all year due to the excessive wet weather – the potatoes have a spray of dithane too. This week however the potatoes and tomatoes both in the greenhouse and outside have been struck. The tubers of the potatoes seem OK so far, although we are still digging them up. The tomatoes have been stripped off the plants in the plot greenhouse and the diseased ones disposed of so we will have to wait and see if the green fruits ripen and are any good. Fortunately we have some tomatoes in our garden greenhouse so maybe we will have more luck with them. It would be interesting to know if anyone on our site is blight free and what varieties they have grown or precautions they have taken! In spite of the weather, blight and anything else that can be thrown at us we are managing to keep the table fully supplied. There is a little dot on our Clustrmap showing someone has visited us from the middle of the Pacific. Does anyone know where this dot is? Check the Clustrmap on the sidebar - I am intrigued! The council delivered a load of wood chippings yesterday to fill the new bay. Sid who delivered them advised leaving a few days so the leaves rot down and the chippings dry a little. None of the content is conifer and I am told nothing untoward has been sprayed on them - they are mainly from trees being pruned in school grounds. At this time the manure bay will not be used for obvious reasons - anyone wishing to obtain manure should source their own trusted supply and have it delivered to their own plot. In the meanwhile the manure bay will be used to house our can recycling collection. For the whole story of the communal area development so far click here. For the next stage Jan is edging the plot with scaffolding boards and will recover with the weed suppressant supplied to us by GeoFabrics of Stourton. This will be covered with chippings. Spalding Plant and Bulb Company are supplying us with some daffodil and tulip bulbs for under the tree where hopefully we will have a raised bed! Is this the ugliest tomato? This tomato was grown in our plot greenhouse. It's a beefsteak tomato variety called Black Crimea - this one certainly looks as though it has been in a war. The flesh and skin are a darker colour than usual so it can be tricky to tell when it is ripe. It tastes good though - much better than it looks!! 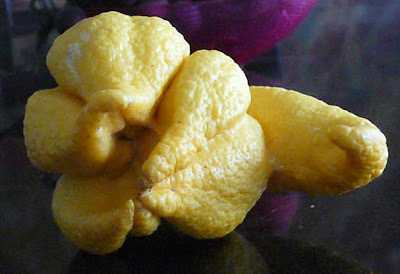 Click here to view our strange fruit and veg album. All grown without the help of any herbicides! Warning the page should carry an X rating! If you have a photo that you would like to share then email a copy to us with a bit about where your contribution was grown. Radio Leeds will be featuring our the Contaminated Manure problem again on tomorrow morning's Breakfast Show. The e-petition started by Paul Wyman is still active with over 1000 signatures. Click here to view and if you wish sign up. Following an RHS statement during last night's programme. I think some people may be under the misunderstanding that aminopyralid is washed out of soil within three weeks. Those of who have been affected know that this is not the case. Just for clarification I'll try and briefly summarise what actually happens. On spraying, the aminopyralid binds to plant matter. This is incorporated into the manure/hay etc. When the manure/compost is mixed into the soil the plant matter gradually decomposes. During decomposition the aminopyralid is released into the soil. It is then that it affects plants. Once released the aminopyralid breaks down into CO2 and water and it is this process that takes about three weeks. However, the plant particles break down at different rates. Traces of aminopyralid may be in the soil for up to a year or more due to the rate of decomposition of all plant particles. We have some tomato plants only now showing signs of distress having been planted in affected soil for months. This means that some aminopyralid is only now being released into the soil in ground that had manure applied in February. (This is really why I have little faith in testing soil samples). If stored in a heap decomposition is slower as the plant material isn't subjected to soil bacteria and unless the heap is turned it will become anaerobic and no decomposition will take place or it will slow down. I hope I have explained that OK.
Our aminopyralid problem was featured on Gardeners' World last night which has resulted in more info on people affected. If you have been affected keep sending your details please. GW had to cut out a lot of the content that they filmed during their visit as the programme last night had to fit in so much but I just hope it managed to reach some people who don't have internet access and haven't read anything in any newspapers. Please keep spreading the information among your gardening friends to try and prevent more of them becoming victims. So can we trust organic labeling? Several people have emailed us to say that they suspect that the source of their herbicide contamination has been commercially bagged organic products or manure from organic farms. Surely this is impossible or is it? The method of gardening utilizing only materials derived from living things. (i.e. composts and manures). Plants grown without the use of chemical fertilizer or pesticides. Any fertilizers used consist of animal or vegetable matter. A method of gardening that does not utilize chemical pesticides or chemical fertilizers. Being composed of, or containing matter related to living organisms. That seemed to be sort of what I expected. OK herbicides aren’t actually mentioned but surely they will come under the same banner as pesticides. So it is impossible - organic products can't be the source of any herbicide contamination! Think again - click here to read what I have so far found out about 'organic' garden products. Please add to the comments if you have any more information on this subject. 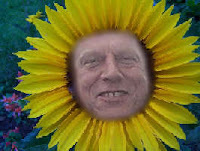 If no challengers come forward then Ron (plot 22) will be named the champion sunflower grower of Green Lane in both the tallest plant and largest flower categories. Challengers - you have 'til Saturday afternoon! Care needed when picking fruit! 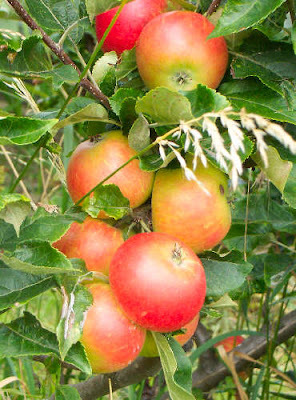 August is a time when many fruits are ready for the picking. This year it seems that the wasps have managed to home in on the ripe fruits before we can meaning fruits have to be gathered with extreme caution! Our plum trees haven't really cropped very well this year so maybe there is a fruit shortage for wasps too. So are wasps really ALL bad? Click here to read more. 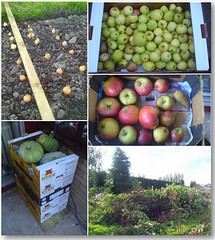 Two of our visitors are new to allotmenting and have sent photos of their plots. Karl and young son Archie acquired their plot in Normanton at the end of March so they even managed to be productive this year. 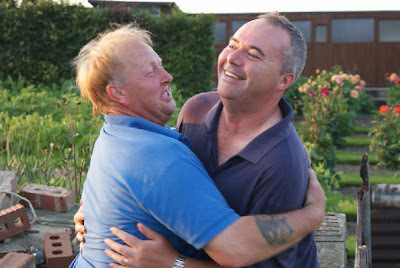 Click here to see their photos and Karl's journal of his first few months of allotmenting with three year old Archie. Thanks to both of them for taking the trouble to send us their photos and accompanying text. This year hasn't been the best year to dip toes into the 'grow your own' world let's hope they have many more prouctive years to come! We have lots of visitors from the USA - so what about one of you sending us some infomation about your plot? August's diary has been updated. Ron - Champion Sunflower Grower! 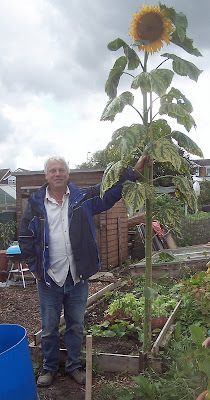 Ron on plot 22 is the winner of the tallest sunflower competition. If no challengers come forward he will also be named winner of the largest sunflower head. Remember the plants judged must have been grown from competition seed! Ron says that the measurers judged the sunflower to be 2.44m or 8 feet tall but it looks taller than that to me - can we have confirmation of this please? Ron's prize is a luxury week in the Bahamas with Molly or maybe we will have to think again as Molly hasn't a passport. Please note that these photos may not be used for any other purpose. Awards for All say ...."No"
I am afraid our application for an Awards for All grant to fund a secure fence was turned down - so it's back to the drawing board. "On this occasion there have been more applications than money available, and we have had to make choices about which projects to fund. We did this by considering how well the project meets our aims and priorities". Anybody any other ideas? It seems a shame that applications aren't carried forward to another date as the only way is to reapply is to try and sort of guess which time of year there may be less applications. It seems that the bottom line (not just with Awards for All) is that fences are not by their very nature inclusive and funders prefer projects that are accessible rather than those that try and exclude people (even thieves and vandals). The other problem is that gardening isn't a sport nor does it belong to the arts - both areas also fairly popular with funders. 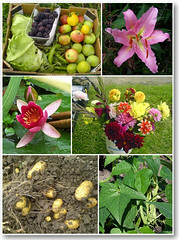 As you can't have failed to notice if you have visited our blog before, vegetables on the plots at Green Lane have developed all manner of strange growing habits this year – mainly strange shaped leaves courtesy of the heaps of manure suspected to be laced with hormonal herbicide residue that we unwittinglyly spread on our soil. You could be forgiven for thinking our peas had also fallen victim and had, had their hormones interfered with in some bizarre way. It’s not their shape though that is out of the ordinary but the colour. People generally expect their tomatoes and beetroot to be red, their carrots to be orange, and their peas to be green. Not on our plot! We have yellow carrots, white and yellow beetroot, all manner of coloured tomatoes and peas in purple pods. The August diary has now started - how did we get to August this quickly? Another step forward in sorting out the communal plot. This in spite of a setback when a mountain of wood chippings were dumped on the part of the plot that we had previously cleared. A phone call later and the chippings were removed but in the process much of the weed suppressant was ripped up. Another phone call was needed and GEOfabrics Limited, Skelton Grange Road, Stourton, Leeds LS10 1RZ agreed to help out by providing us with more fabric. Andy on plot 44 offered to collect the fabric for us and did so with Jan's help. Today Jan, Tracy plot 51 and Paul plot 48 lined the storage bays. Now we just need to get the council to deliver us a load of chippings to fill the chippings bay. The manure bay is not as straightforward as we are reluctant to fill this with manure since our experiences with contaminated manure so for the moment that bay may house the can collection. Now the rest of the plot needs sorting out AGAIN. Thanks to all involed in the work and a special thanks to GEOfabrics Limited for helping us out! Click here for the rest of the story so far. 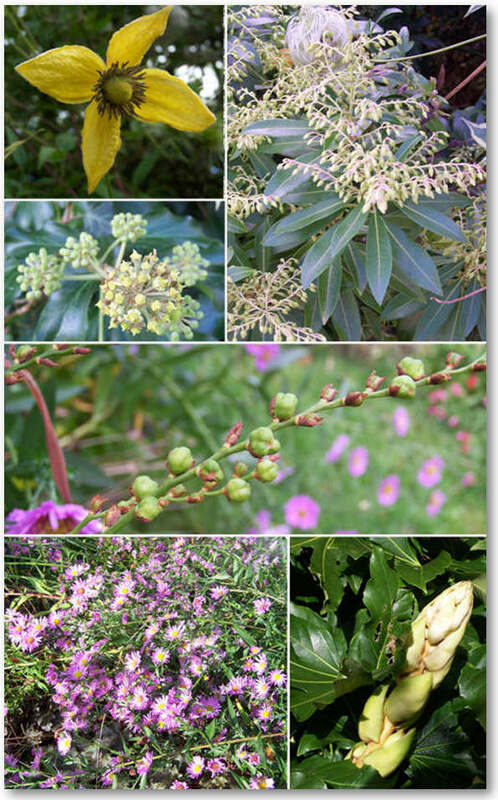 Odette - one of our regular French visitors - has sent some more photos of her garden taken last month. I know lots of people enjoyed looking at the last lot so click here to visit Odette's garden again. Odette tells us that the weather in Castres has been disappointing too but is getting better and better. Her vegetables are a little bit late but now it's hot and everything is growing up at last. The photo below is a taster. Merci Odette! 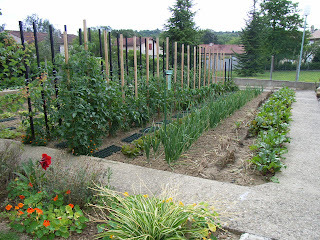 Last year Odette also sent us (well I think she sent her husband out on a mission) some photos of an allotments site in Castres click here . Castres, where Odette lives, is one of Wakefield's twin towns. We'd love some photos from other parts of the world too so if you live in another part of the world why not send us some photos and a bit of information about your garden or vegetable plot too. Just email to the link on the sidebar! It's easy. 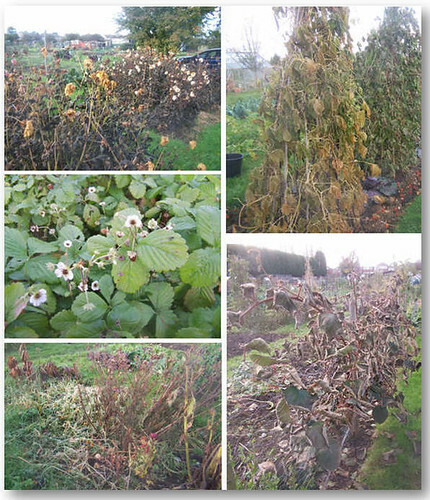 The publicity given to this problem is obviously alerting people to the problem as we have had a couple of visits from nearby allotment holders and gardeners asking for more detail. A map click here has been posted on the web site showing the areas where people who have reported having been affected with contaminated manure to us are based. If you are affected and your area isn't represented on the map let us know. Email us your location and a little about how you have been affected and we will add you to our list of victims click here too! The latest photographs were taken on July 27 2008 - July like June has been a bit of a disappointment. During the last full weekend of July the weather seemed to remember that it was summer and sent the sun out with a vengeance. Having not had previous good weather to enable our bodies to acclimatise for many it was too hot to venture out from shade. The above photos provide testimony to that as plots are desserted. Despite the weather we are beginning to reap the benefits of our labours, that is those of us who haven't had our crops devastated by the manure problem. Some of the crops affected earlier are starting to show signs of recovery, however others are just a lost cause and others are beginning to show signs of distress. It's been a bit of a disappointing season all round really. Still good weather on the 29th so maybe summer has come at last! Click here for July diary page. So what do the farmers have to say? Try reading these forums to have a real eye opener as to what some farmers think about us (the organic brigade?) and chemical use in general! Just in case any farmers are reading this - it isn't just a knee jerk reacton about chemicals and whether they are safe for us or not. It is the fact that our crops are dying! DOW and the PSD accept that there is a problem too. So it's not just the allotment lot as some farmers seem to see us!! I think some have missed the point completely - one posting asks haven't people nothing better to moan about at least they won't get docks in their carrots - not true the weeds are thriving it will be a case of no carrots in our docks! Also it quotes that a group of people are trying to ban aminopyralid due to health concerns - some may be but the biggest concern for others is that crops are being killed or stunted by the contamination - even if the chemical is considered safe to humans. One person admits to not reading labels and another says they are sure Forefront residue only lasts for six weeks - worrying eh? I hope that these views are not representative of the farming community and would be interested to find out what other farmers think! Why not post a comment here? The size of the main page of the blog was becoming very long and so I have reduced the number of posts on the main page, hopefully this will speed up the load time. No posts have been deleted - they are still available in the archive list on the sidebar. You can also use the Google Search facility (at the top and bottom of the page) to find past postings. 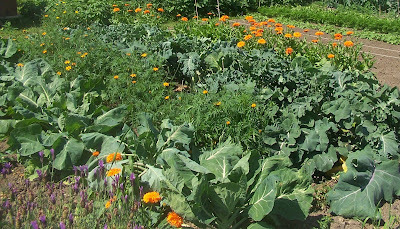 Choose glallotments.blogspot.com and make sure that you enable pop-ups. Just type in your search words. Please let me know if you find the load time acceptable - if not I will reduce the size further. PSD has already confirmed that using manure, which may contain residues of aminopyralid, does not have implications for human health. However, in response to the concerns of allotment holders and leisure gardeners about damage believed to result from these residues, PSD has been in contact with Dow AgroSciences Limited, the approval holder and data owner for the majority of aminopyralid products approved in the UK. Dow AgroSciences have asked for their approvals to be modified whilst the situation is under investigation. PSD has accepted this and amended the approval of all products containing aminopyralid to suspend the approval for sale, supply, and use with immediate effect whilst further investigations are undertaken. Storage is unaffected and it remains legal and safe for these products to be stored by anyone. I think that this confirms the posting that did warn that this was a temporary withdrawal, otherwise why recommend storage! It isn't just the plants that are being affected by dodgy manure! The chimera of Green Lane? Good job the women are unaffected or are they? He carried out a plot inspection where he raised one or two issues which will be passed on to the appropriate people. He inspected the new pedestrian gate following some concerns that we have about its installation. He has promised that the skip will be removed tomorrow and that another skip will be delivered on site next Friday. He also gave us some more spare padlocks to ensure that we have a good supply and can keep the gates fully secured. Thanks to Compostwoman for giving us this award. I'd like to thank my ... No I won't go through all that. Compostwoman's blog can be visited by clicking here. Compostwoman is one of the group of bloggers who have helped spread the news and offer advice on the current aminopyralid situation. The rules are that I have now to be on the look-out for 7 favourite blogs to pass on the award to - so watch this space! Not the time for complaisance! 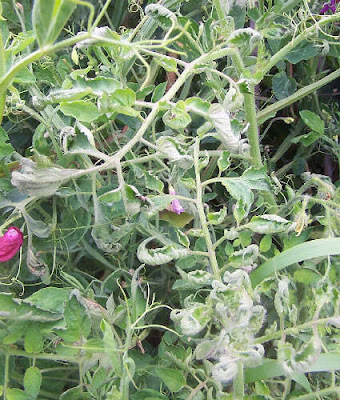 At this point aminopyralid products have been withdrawn by the manufacturer only on a temporary basis, however it needs to be appreciated that herbicides that contain this ingredient will have been used already this year. According to available information the herbicides used this year could be affecting our supply of manure for at least two more years and probably for longer than that depending on how manure is stored prior to distribution. It is therefore, crucial that you only buy your manure from trusted sources - that is from sources who know exactly what has been used on the product from the very beginning of the chain of supply. DOW withdrawing products containing aminopyralid! Below is a copy of part of an email from PSD - Information Services to MEP Nigel Farage! "Dow have now indicated that they are withdrawing products which contain aminopyralid from sale and PSD is formally suspending their authorisations whilst we investigate the options for preventing arecurrence of this problem. A key issue in our consideration will bewhether the conditions of use regarding manure are sufficient, or sufficiently well known". This week when we haven't been dodging the showers we have been battered by the strong winds. It couldn't really be worse for the taller plants especially our cardoons that are really taking a battering. Flowers also seem to be slow to get going - probably due to an extreme lack of heat warmth and sunshine. They must think that they have got up too early! According to the weather forecast this week is set to improve but then again I have heard that one before! One thing that never seems to fail to produce masses of fruit (honestly they are fruits!) are the courgettes and this year seems to be no exception. So it is searching recipes for something different to do with them. No wonder there are recipe books devoted to courgettes. Anyone tried courgette jam? Click here for July's diary. How many incidents the Pesticides Safety Directorate has recorded regarding manure contaminated by aminopyralid in the last 12 months? Mr. Woolas: The first inquiry relating to the potential effects of aminopyralid in manure was received by the Pesticides Safety Directorate’s helpline on 12 March 2008. 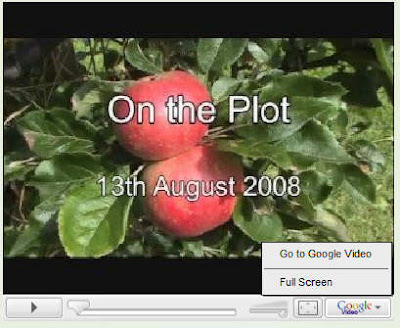 Around 70 inquiries had been received up to 9 July 2008, primarily from amateur gardeners and allotment holders. It is not known how many reports of damage to crops are attributable to aminopyralid. 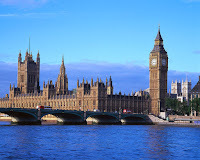 You may also wish to involve your MP and/or MEP in your problem. If you do not know their contact you can acquire this infomation from the Write to Them web site click here You don't need to be personally affected to register your concern. The more people that we can have working on a resolution to prevent a reoccurrence of this problem the better! Allotments are a grey area? And we thought we were a green area. From a regulatory point of view, the law is not particularly clear about the supply of farmyard and stable manure to allotments and gardeners. The disposal of farmyard manure is covered by agricultural waste regulations, which are administered by the Environment Agency. However, where manure is used on agricultural land, it is not treated as waste, and although allotments are not agricultural land, the manure is being used for a similar purpose, so this is something of a grey area. 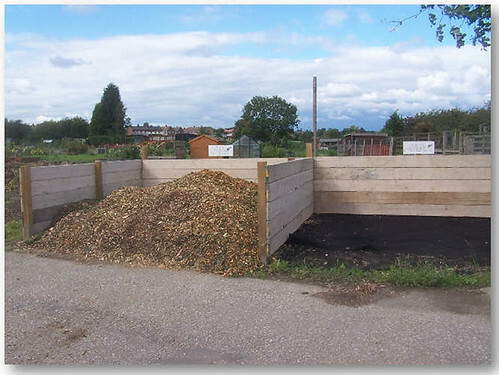 On the other hand, manure from commercial stables appears to be covered by waste management regulations, which are also administered by the Environment Agency, but, again, the supply of stable manure to allotments also appears to be something of a grey area. It is worrying that there appears to be no-one out there looking after our interests. So does this mean that anyone can supply us with manure containing absolutely anything?